Discover the general desert areas where spring-like buds are making a stand. 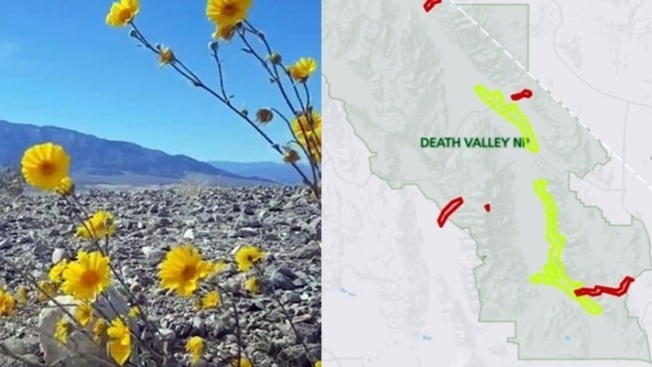 The Death Valley bloom is in the headlines, but where exactly should you go to see the action? A map from the National Park Service lends an idea for flower seekers. PEOPLE ARE LIKELY WARY... of one topic dominating the wider conversation for too long, lest other issues fall to the wayside. But there is something pretty much everyone loves to discuss, or at least pause and be momentarily wowed by, when it happens: a desert wildflower bloom. Maybe it is because we still seek wonder in this workaday world, and the fact that flowers in an unlikely place can push through sand and make a stand not only delights us, it cheers and emboldens the spirit, too. Too much? Nah, not when it comes to a field of flowers in Death Valley National Park. It seems strange to use the word "field" here, as if Death Valley isn't a lunar landscape rife with magnificent, and magnificently weird, rocks and crags and badlands. But a lot of little yellow flowers covering an expanse of desert qualifies in the "field" department, so there the word shall stay. You shouldn't stay these days, however, where you happen to be, should you want to see the rare bloom happening in the arid national park at the end of February 2016. The petals are going all out, extravagantly, and the National Park Service has a map that shows blossom lovers where to go, at least generally. FOR SEEING DESERT FLOWERS... is an adventure, one that takes a bit of fortitude, a bit of gumption, some bottles of water in the backseat, and some snacks, too. You're not exactly going to drive up to a spot and see something postcard-y (well, you might, but that isn't guaranteed). You have to go where the bloom is that week, and you have to see where other travelers in the area are heading, as they, too, get word and hear rumor and check various web sites. The National Park Service flower map has a mid-February date at the top, but check back to see if a refresh comes along, right when you plan your desert sojourn (there's also a phone number up top to ring). The Death Valley flowers, by the by, aren't the only California show-offs, of the wildflower sort, to be bowled over by; the Sierra foothills, the poppies of the Antelope Valley, and Anza-Borrego Desert State Park are all treasured go-to spots for people to get their springtime flower show on.